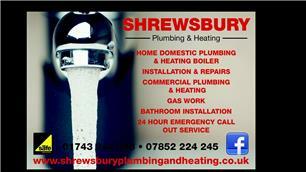 Shrewsbury Plumbing and Heating - Bathrooms, Central Heating Engineer, Plumber based in Shelton, Shropshire. Shrewsbury Plumbing and Heating is a family run business with over 15 years’ experience in the plumbing and heating industry we cover all aspects of plumbing and heating. We pride ourselves in providing helpful, polite and a reliable service. Most important to us is customer satisfaction combined with a very high standard of work. Shrewsbury Plumbing and Heating is always looking to obtain new customers. Whether the job you need completing is small or large we offer friendly advice and competitive prices along with a 24 hour call out service. Shrewsbury Plumbing and Heating are on call 24 hours a day please do not hesitate to call us any time of the day or evening we are here to help.